In mixed martial arts, the majority of its biggest stars compete under one banner: the Ultimate Fighting Championship. The organization boasts a roster full of legends and new faces within the sport. However, there is a competitor who fights for the World Series of Fighting that could be a star in the future. That individual is Justin Gaethje, and he continues to be a fighter to watch. At 27 years of age, Gaethje is a name that many people may not recognize, but he’s a champion that has time on his side. He’s still a few years away from what many consider the “prime” of an athlete’s competitive career. In addition, fighting for one of the smaller organizations in the sport affords him a number of opportunities that would not exist if he was a part of the UFC. Gaethje is clearly the biggest star that the WSOF has to offer. Marlon Moraes is the organization’s current bantamweight champion, but he doesn’t have the same drawing power as Gaethje. David Branch may be a rare two-division champion, but he isn’t promoted in a fashion that would allow him to get much traction within the sport. Naming any of the other champions within the promotion would be a trivia question worthy of Jeopardy. Being the face of the organization at this point in his career allows him to be in a prime position of leverage. His record and penchant for violent finishes would make him a captivating acquisition for the UFC when and if he becomes a free agent. With the recent signings of Matt Mitrione, Benson Henderson, and others by Bellator MMA, it’s clear that MMA now has a real free agent market, one that every fighter should be mindful of. His success in the WSOF increases his value to other promotions throughout the world. Gaethje signed a new deal with the promotion in June 2015, and since then has competed twice, and after his win over Brian Foster at WSOF 29, he could be looking at free agency sooner than you think. 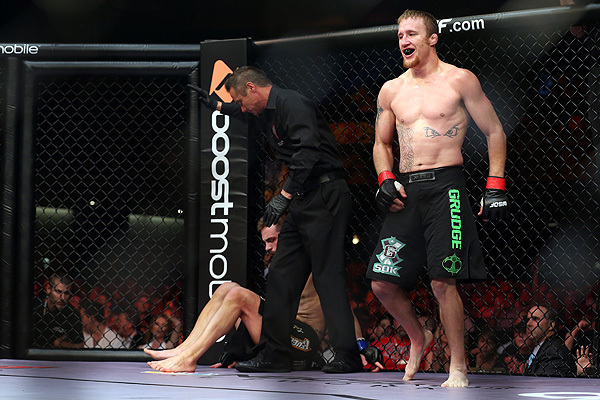 With every fight, Gaethje continues to increase his value to mixed martial arts promotions. If he continues on his path of destruction while remaining WSOF lightweight champion, he should be able to leverage that success into a big deal with the UFC or Bellator. Eddie Alvarez was able to do the same thing when he moved from Bellator to the UFC, and he was at a point in his career where he was past his prime. Gaethje, on the other hand, is flexing his muscles at the perfect time in his career. In a few years he may be the hottest free agent in mixed martial arts.